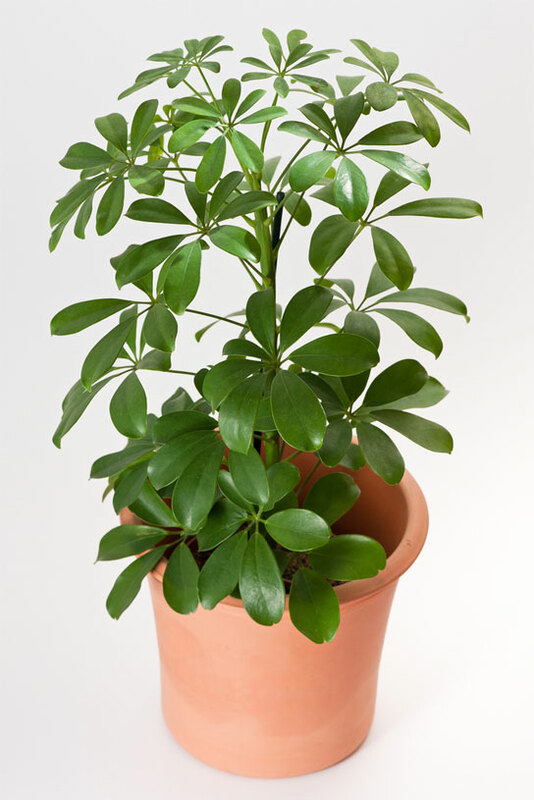 One of my favorite plants to grow in my home is the umbrella plant (Schefflera or Heptapleurum). It is a rather large plant that can grow to heights of up to six feet, and the foliage on the plant grows in a unique eight spoke style that looks like an umbrella; hence the name. Umbrella plants do not bloom, but you can find varieties that feature unique leaf markings. These plants are easy to care for, but caring for the plant incorrectly can be damaging to it. This guide is designed to help you learn how to maintain beautiful, lush umbrella plants that you can be proud of. With proper care, this plant can easily become one of the tallest plants in your home. It grows extremely fast, so you can have a very tall plant within a single growing season. Let’s take a look at some tips to help you care for your umbrella plant properly. Umbrella plants grow best in moist soil, so you will need to water it often. Overwatering the plant can cause the leaves of the plant to turn yellow, while under watering it will cause the leaves to droop. The best way to be sure that you are providing the plant with the appropriate amount of water is to wait until the top of the soil is dry before you water the plant again. Since these plants grow a lot each season, they need a lot of fuel to be able to sustain the growth. You should feed it every two to three weeks with regular liquid fertilizer. Once the plant reaches the height that you want it to be, you can then stop fertilizing it as often. Fertilizing the plant once or twice a year is adequate. Umbrella plants require quite a bit of light, but they should never be positioned in direct sunlight. A few hours a day is possible, but too much direct sunlight will cause the leaves to burn. If the plant seems to be growing more favorably on one side than the other, turn it so that the other side of the plant can get more sunlight. If your umbrella plant receives less than the optimal amount of sunlight, the plant is often accommodating to its living situation. The plant may slow its growth a bit, but it will remain healthy in most situations. The temperature of your home is important for Umbrella plants because temperatures that are too cold will cause the leaves to fall off of the plant. For the best foliage growth, keep the temperature between 65 and 75 degrees Fahrenheit. The all-green leaf variations typically prefer the cooler end of that range, while the types that have more decorative leaves prefer slightly warmer temperatures. Umbrella plants do not require a lot of humidity, so typically the humidity level that is already present in your home is acceptable. If the air is excessively dry, then try misting the leaves occasionally to provide a bit of artificial humidity. This is also a great way to assure that dust does not accumulate on the leaves of the plant. In addition, if you are having a pest problem, raising the humidity level could help solve the issue by deterring the bugs. Since these plants grow so quickly, it is very possible that you will need to prune the plant in order to keep the plant the shape and size that you desire. Umbrella plants bounce back quickly, so even if you harshly prune away a good bit of the plant, it will grow back fuller that it previously was. This is a great way to get a plant that is sluggish to become more lush and beautiful. Once an umbrella plant reaches maturity, it will need to be repotted every three years or so. Once the roots start growing through the drainage holes in the pot, it is time to repot. Make sure to use a relatively large pot because the height of this plant can make it top-heavy, and always repot Umbrella plants during the spring of the year. Propagation can occur by using cuttings from a mature plant. These cuttings should be at least two inches long to help the new growth take root. Make sure that the tip of the plant that is growing is not buried in the soil. These plants can also be grown from seeds if you are having difficulty with the cuttings taking root. • Fungal Leaf Spots – When a plant has this disease, black or dark brown spots appear on the leaves. Eventually the infected leaves will fall off and the disease will spread. To prevent this from occurring, it is best to remove an infected area before it has the chance to spread. • Bacterial Leaf Spots – If yellow spots are noticed on the leaves of your plant, then it may have a bacterial disease. This is best taken care of by removing the spotted leaves as soon as they are noticed. • Root Rot – When an Umbrella plant receives too much water, root rot can occur. Never allow the plant to sit in a pool of water, and if root rot does occur, cut out any infected areas of the roots and repot it with new soil. • Pests – Spider mites are a common problem with umbrella plants, especially when the air is dry. If you notice webbing on the leaves, wipe them clean and raise the humidity levels of the room to deter the pests from returning. Umbrella plants are small tree-like plants that can add a lot of atmosphere to your home. They make a great plant for the entryway of your home, and they can be pruned to accommodate the size and shape that you desire. If you are looking for a stunning plant that does not bloom indoors, then the umbrella plant is perfect for your home.